DO NOT SNAIL MAIL OR PDF DOCUMENTS. We will not be able to use them. Data must be in .doc, .xls, .txt, or .csv format. Need assistance doing this? Call us! Pilots – Please click here to be taken to the Delta Pilots page. 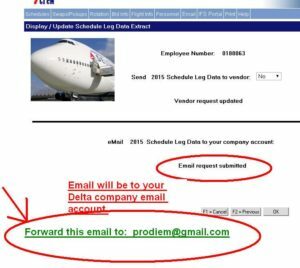 Flight Attendants – Follow the instructions below to obtain your Schedule Leg Data and email to Pro-Diem, Inc.
You can not do this on a company computer in operations! The next window asks two Yes/No questions. An email should arrive in your company email account within 5-20 minutes. Forward the email to prodiem@gmail.com. 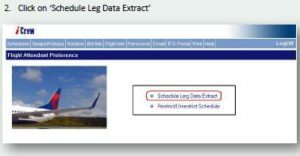 Be sure to include your training travel dates and location at the top of the email. Once data has been submitted and payment made you will be placed in the queue for processing. Please check our home page for current turnaround time. 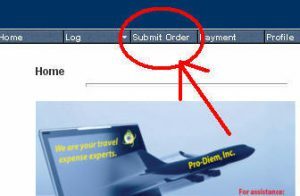 This is the flight data submission option for Delta Air Lines Flight Attendants.